In today’s travel environment, you can’t be even a minute late for check in at the airport. 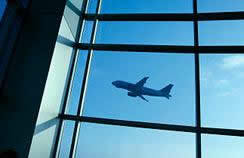 When you need to get to any of the areas airports on time, you can depend on us to get you there quickly and safely. We can meet arriving passengers at the ground transportation booth located outside of baggage claim and load their luggage into the waiting vehicle. Below are directions to follow when departing the aircraft and finding your limousine. When arriving at Jacksonville International Airport proceed to the luggage claim area, retrieve your bags if necessary. Then proceed to the Ground Transportation booth located outside of baggage carousel number one. Give your name or the name of your group to the attendant at the booth and he/she will call your driver around from the staging area. We will transfer baggage from our vehicle to the hotel bellman. Our state of the art communications along with dedicated dispatchers insure no missed connections. Our chauffeurs are in constant communication with our dispatch center. The dispatch staff starts monitoring flight status hours before the expected arrival of the aircraft and keep the chauffeur updated with information. We can provide all our clients with chauffeur phone numbers so when they arrive they can be in direct contact with the chauffeur. Our dispatcher checks the status of outbound flights prior to picking up passengers. If we have been provided with the flight information, we are able to inform your passenger about potential delays that may affect travel. In case of extended delay, we may recommend a later pickup time. Complete passenger manifest are available upon your request, including arrival times, flights, hotels drop-off locations, and arrangements to return passengers to the airport at the time they specify.